Ambrosia Remedies (P.) Ltd. is Manufacturer & Exporter of Tablets & Capsules (General) and Liquid Orals for HUMAN & VETERINARY USE. (Vitamin A Concentrated IP 5000 IU + Vitamin E 50% IP 25mg + V Available in 10 tab. Alu. Foil.itamin C IP 100mg + Copper (As Sulphate BP) 1mg + Manganese (As Sulphate )BP 1mg+ Zinc (As Sulphate) IP 7.5mg + Selenium ( As Selenious Acid) USP 150mcg. Available in 10C Blister Pack. Box of 10 X 10C. 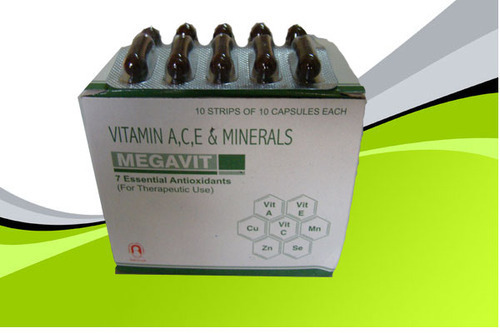 We can manufacture MEGAVIT CAPSULES for Export & on Third Party Manufacturing Basis. Packaging Details In 10C Blister Strip & Box of 10 X 10C or as per choice of the party. Ambrosia Remedies (P) Ltd. was set up in 1991 at Vaghodia, east of Vadodara in state of Gujarat of India with Tablets & Capsules (General) & Liquid Orals Sections. The Company is promoted & being managed by technocrats who have extensive experience & wide knowledge of the Pharmaceutical industry. Mr. Tarun C. Parikh, who is our Managing Director, is B.Pharm & an LL.B with experience in the discipline of manufacturing & marketing of pharmaceuticals .He is supported in his endeavor by other two directors with vast experience in the field of Finance, Accounts & Purchase & together they have shown excellent growth. The manufacturing facilities were upgraded as per Revised Schedule 'M' of The Drugs & Cosmetics Act, 1940 in 2005. The company was also awarded state GMP certificate as per Revised Schedule in 2006. The company is run by services of highly technically qualified personnel at all levels. We are also members of Pharmaxil (Pharmaceutical Export Promotion Council) & Gujarat Chamber of Commerce & Industry who have established our credentials with clients as trustworthy manufacturers. The Company has spread its wings in Domestic market as well as Export market .We have our marketing network in Nine States of the country on Franchisee basis. We have also been supplying our products to various Government Institutions such as BCCL, ECL & Gujarat & Tamilnadu Government Hospitals .We have been exporting our products to many countries viz.U.S.A, The Netherlands, Morocco, Afghanistan etc. The Important & Salient feature of our company is specialized skill for formulations of Activated Charcoal tablets, Dual Coated Tablets of Activated Charcoal with Simethicone & Activated Charcoal Capsules. We are exporting Activated Charcoal Tablets / Capsules / Dual Coated Tablets to at least eight countries.